Pretending your phone is a Tricorder to find buried treasure while avoiding Muggles… what’s nerdy about that? Well, it turns out Geocaching is a nerdy sub-culture with it’s own language. At least we eventually figured out what BYOP means. At first it seemed silly that you were instructed to avoid the notice of “muggles” (non-Geocachers). But then we found ourselves poking around in the alley behind a McDonald’s like a couple of cracked-out hobos trying to find their lost stash. Not too far from the truth, once you catch the bug, actually. 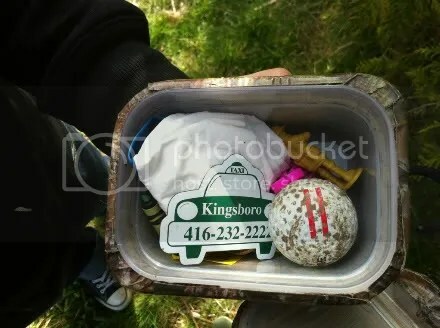 The second cache we found.